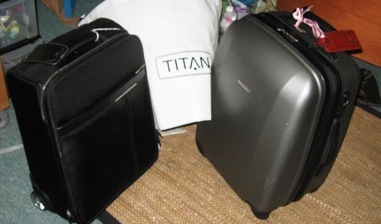 The Divaonthego packed her Titan bags for a cruise onboard the super luxurious Crystal Symphony from Miami to Costa Rica. One of two mid-sized luxury liners operated by Los Angeles-based Crystal Cruises (www.crystalcruises.com), the newly refurbished Symphony offers an upscale experience for 922 passengers–the perfect size for the Divaonthego who just can’t get her sea legs around those mega ships that carry thousands at a time. Not that she hasn’t sailed on the bodacious boats, but she prefers more compact vessels. The Axxiss series is styled in classic black nylon with genuine leather trim and ncludes a business trolley, and business cases that accommodate 15.4″ and 17″ laptops. All products feature laptop compartments and are thoughtfully organized to cater to the needs of business travelers who demand both function and style. TITAN® Axxiss is covered by a Titan® 5 year warranty. Because we live in Los Angeles we decided to fly to the ship a day earlier to avoid any delays, even though the Symphony sails at 9 PM. We just wanted to be sure. So we surfed the web and came up with what sounds like an ideal hotel for our overnighter, Kimpton’s EPIC– Hotel–a boutique waterfront hotel, is locate at the edge of the Miami River and Biscayne Bay. 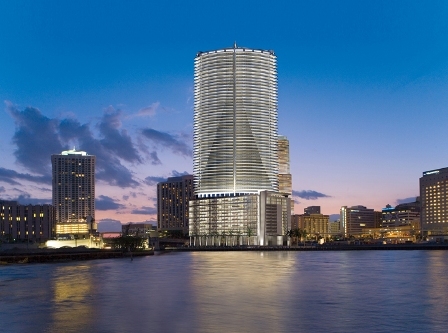 The 54-story, elliptical-shaped high-rise has 411 guestrooms and suites, including two luxury corner Presidential Style Suites, 24 one-bedroom corner suites and 24 junior suites. All suites feature custom furnishings and fine fabrics, as well as private balconies with glimmering views of Miami and the bay. Additional in-room amenities and services include: Fine Italian linens with luxurious triple sheeting and throw blankets, LCD flat screen televisions. Spa-inspired luxury bath amenities from Acqua di Parma, twice-daily housekeeping service, High-speed wireless Internet access.